March 13, 1947, by Shelly Robinson, in GRPL 125, published in Grand Rapids Press, Wednesday, February 19, 1992, p. C1. Opened in 1914 as the Empress by an unknown owner, it was renamed the Keith's Empress and later the B.F. Keith's on being sold to that vaudeville circuit in 1924. The theater was managed by Walter Norris from 1924 to 1930, when he transferred to Detroit. Still later, it was sold to RKO (Radio-Keith-Orpheum) and renamed the RKO Keith's. It originally had a seating capacity of 1,900, which was reduced to 1,750 after remodeling. One of the many battles waged by local African Americans in their struggle for equal protection under the law was launched at the B.F. Keith's Theater. On the evening of December 14, 1925, Dr. Emmett N. Bolden, a dentist; Dr. Eugene E. Alston, a physician; and two companions planned to attend a vaudeville show and a film at the Keith's. The four men were turned away, however, when they requested seating on the main floor. One of several local theaters to draw a color line, the Keith's restricted individuals of African descent to seats in the balcony. Two days later, supported by the Grand Rapids chapter of the NAACP, Dr. Bolden filed suit in Superior Court against the Grand Rapids Operating Corporation, the theater's holding company (Case No. 3043, State of Michigan Superior Court of Grand Rapids). Attorney for the plaintiff was Oliver M. Green. Assisting with the legal research was Floyd H. Skinner, then in his final year at the U. of M. law school. In presenting Bolden's case to the court, Green argued that under Michigan law and the Civil Rights Act of 1885 (amended 1919), discrimination in public accommodations in any form was unconstitutional. The holding company maintained that a “theater is a private enterprise, and may exclude therefrom any person whatever.” The decision came down in favor of the theater operator. On June 6, 1927, the Michigan Supreme Court reversed the lower court's ruling. Although no damages were awarded to Bolden, the victory was nevertheless his when the justices upheld the principle of civil rights by requiring the Keith's Theater (and by extension, all others) to provide integrated seating. Green and Bolden both died within a few years of the case, but Floyd Skinner went on to a distinguished legal career in Grand Rapids. (Olson, A Grand Rapids Sampler, p. 153.) Walter Norris returned to Grand Rapids in 1933 to be the city manager for the Butterfield chain, which by then was operating both the Keith's and the Regent. They were purchased together by the City of Grand Rapids from RKO on March 12, 1962, for $594,500 as an acquisition of property for the downtown urban renewal program. The city took possession of the Keith's on July 1, but RKO continued to operate it under a lease agreement. 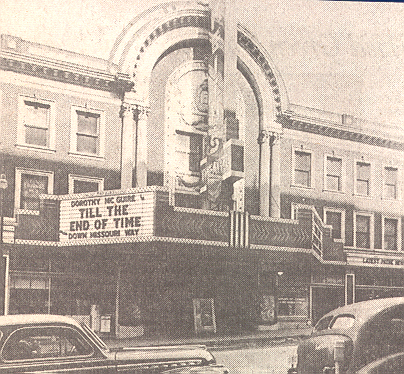 The theater closed its doors on September 5, 1962, under manager John Otterbacher, and was demolished for urban renewal in late November of that year.